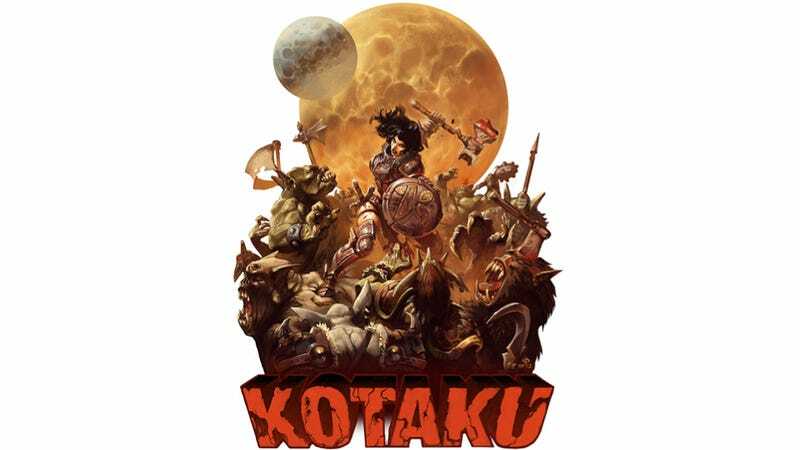 Our good friends at t-shirt company Meatbun are selling two official Kotaku shirts. The first, pictured above and dubbed "Kotaku-Tan II," is the work of the amazing Dan Dussault. He was inspired by the just-a-wee-bit-more-amazing Frank Frazetta. Our warrior lady is surrounded by trolls from Dragon Quest, EverQuest, Skyrim and World of Warcraft. Yours for $24 (The shirt is black, if that matters to you). Oh, but maybe you don't want a warrior woman on your American Apparel-based t-shirt! Fine. How about a "K"? This alternate design was made by one Patrick Gerrity. He was not inspired by Frank Frazetta. At least, he wasn't this time. This shirt also can be had for $24. Perhaps you just can't decide. Or perhaps your torso is really cold and you need to layer up. Then buy both shirts. Meatbun will sell you them for $39. Ask for the Combo Pack. Thanks, in advance, for wearing a Kotaku shirt. You're welcome, in advance, for all the compliments you'll receive.